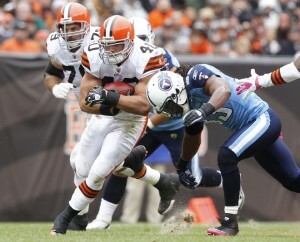 Peyton Hillis leads the Browns run game. Cleveland quarterback Colt McCoy had a career-best 350 yards in the Tennessee loss and set a franchise record for both completions (40) and attempts (61). He completed passes to 11 receivers in that contest as well. In his past two outings on the road, McCoy has three touchdown passes and a 112.8 quarterback rating. Hillis enters the game needing six catches to reach 100 for his career, while tight end Benjamin Watson registered his 25th career touchdown catch against the Titans and needs 64 receiving yards to reach 1,000 with the Browns. Wide receiver Mohamed Massaquoi had a touchdown catch in Cleveland’s 2009 meeting with the Raiders, while rookie wideout Greg Little — a second-round pick in last April’s draft — had a career best in catches (six) and receiving yards (57) in Week 4. Wide receiver/return specialist Joshua Cribbs registered a 99-yard kick return touchdown against the Raiders in 2007 and averages 28.4 yards per runback, third-best in the AFC. The Oakland defense ranks second in the AFC with 14 sacks, and defensive tackle Richard Seymour tied a career high with two sacks last week. He needs one to surpass his season-best total of 5 1/2 set last season. Defensive end LaMarr Houston recorded his first career interception last week, while Huff’s decisive pick against the Texans was his first of the season. Rolando McClain, who’s been hobbled this week with an ankle injury, leads the linebacking corps with 34 tackles and a sack on the season. Cleveland’s offense is 26th in the league in scoring (18.5 ppg), 21st in total yards (321.0 ypg), 17th in passing yards (235.2 ypg) and 27th in rushing yards (85.8 ypg). On defense, the Raiders are 28th in points allowed (26.6 ppg), 31st in total yards surrendered (422.4 ypg), 29th against the pass (299.6 ypg) and 22nd versus the run (122.8 ypg). Raiders quarterback Jason Campbell has four touchdowns, two interceptions and a 104.1 passer rating in the fourth quarter this season, and is 1-0 against the Browns as a starter. The Raiders have an NFL-best nine rushing touchdowns this season and average 178.8 yards per game on the ground in 2011, the second-most in the NFL. Running back Darren McFadden is averaging 123 rushing yards in two home games this season and is tied with Buffalo’s Fred Jackson for first in the NFL with seven rushes of 20-plus yards this season. Wide receiver Darrius Heyward-Bey is averaging 107 receiving yards per game in his past two matchups, while counterpart Chaz Schilens had a game-winning 18-yard touchdown catch last week. Kicker Sebastian Janikowski hit on three field goals of 50-plus yards (54, 55, 50) against the Texans, tying an NFL-record for most made kicks of at least 50 yards in a single game. For the Browns, linebacker DQwell Jackson leads the team with 40 tackles and safety Mike Adams aims for a third straight game with an interception. Cornerback Joe Haden is tied for the NFL lead with eight passes defensed, but is questionable to play on Sunday due to a knee injury. Defensive end Jayme Mitchell leads the front line with 14 tackles and has 1 1/2 sacks and a forced fumble as well. Oakland’s offense is eighth in scoring (27.2 ppg), ninth in total yards (381.6 ypg), 22nd in passing yards (219.8 ypg) and second in rushing yards (161.8 ypg). Cleveland’s defense is 13th in points allowed (23.2 ppg), ninth in total yards allowed (320.0 ypg), fourth in pass defense (195.5 ypg) and 25th against the rush (124.5 ypg). McFadden figures to be a major factor for the Raiders, who’ve been successful running the ball and will be encountering a foe that’s been somewhat less successful in stopping it. Oakland’s defense isn’t statistically sound, but it’s created significant pressure up front, which could be enough to rattle a still-young quarterback in McCoy, whose running game hasn’t been a support thus far. Just how much push a road-weary Raiders team gets from its home fans — and the emotion of the loss of Davis — could determine how dominant they might be. If the atmosphere is electric, it’s trouble for the Browns.